There is a band of thieves that prowl the boardwalk in Ocean City just waiting for the right time to take what they want. 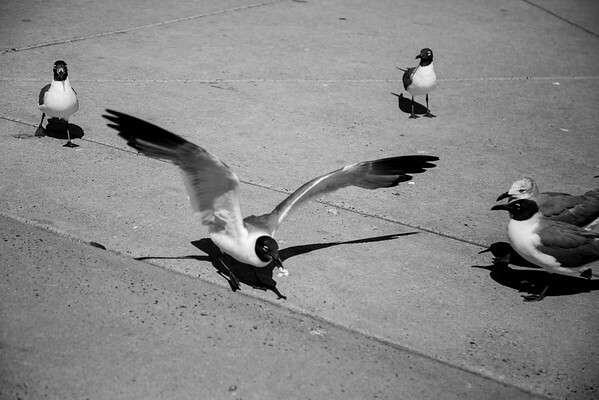 They are the laughing gulls that flock to the boardwalk. Over the years I have seen them take food right from the hands of unknowing visitors. I made this photo while waiting for the girls, and I couldn’t help but notice how the gulls were making there presence known. That year one came swooping down and knocked a pizza out of my hand. I have seen them swarming around the french fry stands just waiting for the right moment. When it comes they fly in like a daredevil to steal what they want. It is quite amazing to see. When the weather is about to get bad they seem to crank it up a notch as well. When I see them getting a little more aggressive it usually means that it is time to get back to the condo. This was the first trip that I had with my Canon 24-105mm lens. I had really dreamed of this lens for a few years prior to finally buying it, but never pulled the trigger. This lens is from what I have found the perfect lens for a vacation. You have a wide angle side, and a fairly tight 105mm side. You can do a lot with a little on your side. I now own the new version II of this lens, and it didn’t take me nearly as long to pick that up.